Staying with us and enjoy the perfect accommodations. We care much more about your trip in Vietnam. Angel Palace Hotel provides Angel Palace tours for our beloved clients. Angel Palace tour desk is operated by our friendly sales staff using the best tour providers in Vietnam. Use our trip planner to assist in putting together your Hanoi vacation and let Angel Palace operator make the arrangements for you. Angel Palace tour desk listed the things what to do in Hanoi as well as some destinations nearby Hanoi in the short time. Hanoi: With its tree-lined boulevards and lakes, its blend of French, Chinese and Vietnamese architecture, Hanoi is the jewel of Asia. Charming pagodas and the "36 streets and 36 wares" of the fascinating Old Quarter will vie for your attention. And there are other famous sights: the impressive Ho Chi Minh Mausoleum, the ancient Temple of Literature, the Lake of the Restored Sword, the One Pillar Pagoda, the Hanoi Opera House, the History Museum, the Fine Arts Museum, and the Ethnology Museum, please look at the itinerary below to have more details. Depart at 8.00 am from hotel, we begin to visit Ho Chi Minh complex, learning a lot about his great life comprising the Mausoleum, the Presidential Palace, and his residential place. Next we will be traveling to the Temple of Literature – the place of the first University and temple for Confucius in Vietnam, followed by lunch served at a local restaurant. In the afternoon, visit the most interesting of numerous museums in Hanoi - the Museum of Ethnology. Then check out the Hanoi Hilton Prison for a while to learn about the place where lots of famous prisoners were kept during the Vietnam war. The journey will be continued by the visit to Opera House and Ngoc Son temple in Hoan Kiem Lake. We finish the day by attending a very nice show of Water Puppets or by taking the 1 hour relaxing Xichlo (rickshaw) trip around the Old Quarter. Excluded: Insurance, drinks, water puppet ticket or xichlo fee, other personal expenses. Tips are welcome. 7.30am: 3 hours – Go Asia Travel tour guide and driver pick-up at hotel. Road trip to Ha Long Bay City through Red River delta. Enjoy the scenery of tranquil villages embellished by peaceful green paddy field in the rural Vietnam. 11h.45 arrive in Ha Long City, get on the Boat and have lunch on boat. - Join-in group is available. Please contact us if you need further information. 8:00 am leave the hotel at Hanoi. About 10:30 am arrive at Hoa Lu Ancient Capital. In 968, Dinh Bo Linh declared himself as the King. Since then Hoa Lu existed as the capital for the next 41 years (968 – 1009), of which 12 years was under the Dinh dynasty – King Dinh Tien Hoang, the country named Dai Co Viet, and 29 years later was under the Le dynasty – King Le Dai Hanh. In 1010, King Ly Thai To moved the capital from Hoa Lu to Thang Long – present day Hanoi. Hoa Lu became the old citadel. In Hoa Lu there are now 2 temples have been built on the ground of the old royal palace, one is dedicated to King Dinh Tien Hoang, the other is to King Le Dai Hanh. The visit offers a chance to know more about part of feudal dynasties and historical periods in Vietnamese history. 11:30 am leave Hoa Lu to Tam Coc at around 12:00 pm. Having lunch in Tam Coc in a local restaurant and enjoy lunch served with goat meat which is famous as the local specialty . 1:30 pm, 5 minute-walk to the boat station and start the 2hour-boat trip to visit Tam Coc. Known as “Halong Bay on land”, Tam Coc are three limestone caves stretching along Ngo Dong river. The boat trip is a nice journey along the river with peaceful scenery of limestone mountains, rice paddy and the site of some temples along the way from Hang Ca (first cave) to Hang Hai (second cave) and Hang Ba (third cave). 4:00 pm leave Tam Coc and drive back to Hanoi. Arrive Hanoi at 6:30pm. 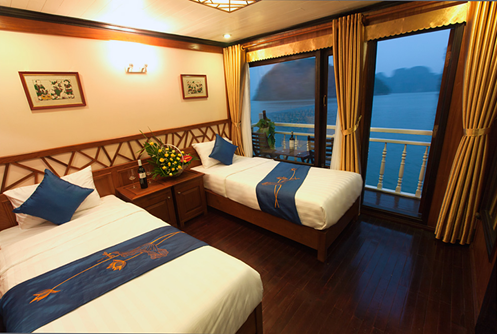 Finish unforgettable full day trip at your hotel in Hanoi! - Meals as mentioned in the itineraries: Vietnamese food, Asian Food basic. - Private transfers within the tour by air-conditioned vehicle, including pick-up and drop-off at hotel. - Boat trip on Ngo Dong River rowing by local people. - English Speaking Tour guide. Other languages on request. - All entrance and sightseeing fees. - All taxes & services charge. - Beverages and other meals do not indicate in the program. 8:00 am leave the hotel at Hanoi. About 10:30 am arrive at Hoa Lu Ancient Capital. In 968, Dinh Bo Linh declared himself as the King. Since then Hoa Lu existed as the capital for the next 41 years (968 - 1009), of which 12 years was under the Dinh dynasty - King Dinh Tien Hoang, the country named Dai Co Viet, and 29 years later was under the Le dynasty - King Le Dai Hanh. In 1010, King Ly Thai To moved the capital from Hoa Lu to Thang Long – present day Hanoi. Hoa Lu became the old citadel. In Hoa Lu there are now 2 temples have been built on the ground of the old royal palace, one is dedicated to King Dinh Tien Hoang, the other is to King Le Dai Hanh. The visit offers a chance to know more about part of feudal dynasties and historical periods in Vietnamese history. 4:00 pm leave Trang An and drive back to Hanoi. Arrive Hanoi at 6:30pm. Finish unforgettable full day trip at your hotel in Hanoi! - Boat trip rowing on river to discover 7 tunnel caves in Trang An. 2.00 pm: (4hr trekking) Visit Lao Chai Village – home of Black H’mong minority. Trekking through Muong Hoa Valley with many beautiful sceneries along the river, then reach Ta Van village to make friends with a Dzay family where your dinner and homestay are served here. Night 1: Be escorted to the railway station by Angel Place Hotel staff for boarding the train to travel up Lao Cai city. This 2-day-tour covers almost all the beautiful highlights of Halong Bay and some famous fishing villages nearby. Tourists can fully experience sea kayaking, enjoy the fresh seafood and take part in other exotic activities. Shuttle transfer Hanoi - Ha Long City (journey about 3.5-4 hours including 1 reststop), departing from Hanoi office, 125 Hong Ha street at 7:45 daily and from Halong office, Tuan Chau Marina at 12:00 daily. Please book further. 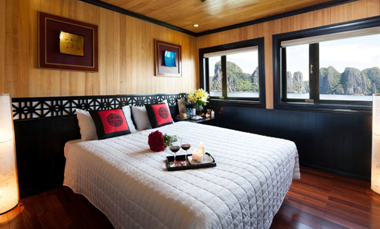 This 3-day-tour can help tourists dig deeper in the exquisite scenery of Halong Bay. Tourists can have further access to a lot of stunning stopovers and get pleasure from the luxury cruising services with memorial experiences. 06:30: Enjoy Tai Chi instructions on the sundeck in 30 minutes.07:30: Enjoy light breakfast with tea, coffee, cake and toast. 12:30 - 13:30: Enjoy set lunch. Cycle to Viet Hai pier. Back to the boat and continue cruising to the Titov island. 08:30: Visit Amazing cave discovered by the French in 1901 and it's symbol for geology value of Halong. • Shuttle transfer Hanoi - Ha Long City (journey about 3.5-4 hours including 1 rest stop), departing from Hanoi office, 125 Hong Ha street at 7:45 daily and from Halong office, Tuan Chau Marina at 12:00 daily. Please book further. .• All services and items not mentioned specifically in the list above. SINGLE SUPPLEMENT: USD 40 .Family rooms and extra beds are available on request. Itinerary is subject to change upon weather conditions Doctor and Pharmacy are not available on Alova Gold Cruise We arrive back in Hanoi between 4:00pm & 5:00pm – if you have to catch a flight, bus or train later in the evening, contact me to assist you with your schedule and transportation choices. Family rooms and extra beds are available on request. • Visiting Sung Sot cave "Amazing Cave"
• Children under 5 years old are FOC, sharing room with parents.